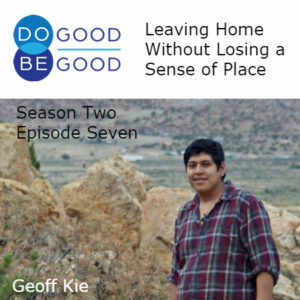 Geoff Kie grew up on the Laguna Pueblo in New Mexico. From learning Chinese to standing up for what he felt was right in a difficult situation, Geoff shares his journey towards education and leadership. This path also led him to AmeriCorps VISTA. He served at the Pioneer Museum in Flagstaff, Arizona and created a special Night at the Museum event to highlight different voices in stewardship. 00:07 Announcer: This is Do Good, Be Good. The show about helpful people and the challenges they face in trying to do good. Your host is Sharon Tewksbury-Bloom, a career do-gooder, who also loves craft beer and a good hard tackle in rugby. Sharon speaks to everyday people about why they do good, and what it means to be good. 00:27 Sharon Tewksbury-Bloom: Hi everyone, I’m your host, Sharon Tewksbury-Bloom. Today’s podcast is brought to you by Do Good, Be Good, AmeriCorps Training Series. More on that later. 00:43 Geoff Kie: So greetings everybody. My name is Geoff Kie. I’m from the Pueblo of Laguna. My clans are Big Horn clan and Little Turquoise clan. I just introduced myself in the language that we speak in Laguna which is Keres. 00:57 ST: The voice you just heard is our guest for today, Geoff Kie. I met Geoff when I started an AmeriCorps VISTA program, here in Flagstaff, Arizona. Geoff was one of our first VISTA members. As Geoff mentioned, he grew up in the Laguna Pueblo in Northwestern New Mexico. During high school, Geoff left home to go to a larger school with more opportunities in Albuquerque. He was a very driven student, and he thrived at this new school but he still found it hard to be away from his parents and his home. After he graduated from high school in Albuquerque, he moved even further away from Laguna to come and study at Northern Arizona University in Flagstaff. Geoff talks about those challenges and opportunities that he faced as a teenager. 02:21 GK: “Be a man. You can do it.” And so I just remember kind of spilling my heart out, I was just like crying in the car. Made it to Albuquerque and just like, it was almost like at that point I was like, “All right,” that she’s right. “I have to do this for myself.” And since then, I’ve kinda gone nonstop. I’ve been going to Albuquerque for the remainder of my three years of school, kinda doing what I can back at home for my community and then coming here to a higher education to where, by the time I got here into Flagstaff and had the dorm, that was it. 02:57 GK: I was like, “All right. Bye mom and dad.” They were like, “We’re still here.” I was like, “I’m all right. I’m just gonna go explore.” Like not afraid. I was just like, “Alright,” making new friends. Even to this day, even international friends. During my high school career, being challenged in Albuquerque, I also kind of took that challenge too, to explore these different things. So I also enrolled in this program outside of school, so which is called like “The Career Enrichment Center.” So I essentially took like, officially two years of Chinese language, but equivalent of four years of Chinese language. During my junior year, that’s when I first started taking Chinese, on top of that full school day, I had three hours a day for four days a week. So essentially 12 hours of Chinese language learning per week. 05:26 GK: I studied Chinese in Albuquerque. And they’re just like, “What?” They’re like… It blew their mind. I was like the tallest Native guy they’ve probably ever seen, probably one of the first Native people they’ve seen in America, just lo and behold, this guy knows Chinese, and he’s pretty good at it. 05:43 ST: Around the same time that Geoff was learning Chinese, he was also learning about leadership and service during a summer program. 05:52 GK: I got accepted into this summer program, which primarily takes Pueblo youth and also encompasses other indigenous youth that are located in New Mexico. So that also includes Apache and Navajo. It was really neat to see that diversity. Before that time, I was only just primarily focused on my community members, my Pueblo of Laguna. Like, “I only care about Laguna,” and anybody else is weird. You’re just cut in this community bubble. At the same time, it was neat to explore these concepts of native nation building along with other Pueblo youth and just native youth in general. That first program, we were in Santa Fe for a couple of weeks. They gave us a complete run down of what it means for native nation building. It was essentially like a precursor to my applied indigenous studies program. So Regis Pecos, he is one of the co-founders, Carnell Chosa is another co-founder for the leadership institute. And without them, honestly, I probably wouldn’t have reached this point in my life. We just started this dialogue. What does it mean for native nation building and what does that mean for us, and what is our role? I think one of the main tag lines that was part of that program too is, “What will be your contribution?” So we spent a full week at Princeton University, at the Woodrow Wilson School of International Affairs. 07:21 GK: So from there, we got to hear from all sorts of experts. A couple of names that jump out too was Walter Echo-Hawk, Liz Shmita Huamin, all their different perspectives of native nation building with language and culture identity. All these different things that we take for granted, especially in New Mexico ’cause we have set pueblos and we haven’t had to suffer a diaspora, kind of like the assimilation of culture that wasn’t really a prevalent thing within New Mexico, because of the Pueblo revolts of 1680, which is again, just another milestone of cultural resilience. And that was just another understanding amongst Pueblos as well, because without that momentous day in August 10th of 1680, who knows where we’d be now with our culture if our people didn’t revolt against the colonizing powers at the time? 08:17 ST: The summer before Geoff started college, he was in a leadership program in Laguna Pueblo. An unexpected turn of events led Geoff to question who he was going to be as a community leader. 08:29 GK: There was this group of friends that decided to make a Breast Cancer Awareness bike ride from Pennsylvania all the way to California. Their group was called the Pink Pedal. So that was kind of them raising awareness of breast cancer. They had a really neat blog, it was just them documenting their trip and the ups and downs of it. During that same summer, one of the cyclists was hit and killed by one of our members of the community of Laguna Pueblo. So from that instance, being that it was a non-native member or non-native person who was passed away on tribal lands, it became a federal investigation type of thing where there was a lot of red tape. No one could communicate what was happening. 09:50 GK: From that moment, we wanted to do a fundraiser for John, that was his name, to also recognize and and give our reverence to that family that, even though this kind of situation is happening, that we recognized that he was a loved one, a brother, son. For some odd reason that our host program wanted to silence us for some reason, but our main facilitator Lee Francis, he was like, “Guys, keep doing it. You guys are doing an awesome job. I’m so proud of you guys.” We were like, “Yeah.” And also our other facilitator, her name is Lenora Mariano, so she was kinda our day-to-day facilitator. So she’s all like same thing, “Let’s do it, guys. We’re so proud of you guys. You guys are impacting the community, you guys are getting involved.” But the powers that be found that as very against the grain, so to speak. But it’s also over simplifying it, I think a little bit too. But they eventually fired both our facilitators, replaced them with somebody that was just like watching us to make sure we’re not doing social media posts about our fundraisers and stuff. So we had to essentially do covert operations to get these fundraisers and stuff going, and even doing them outside of our work time. 11:07 GK: That was my first instance of just community engagement, organizing, and not being afraid to challenge the powers that be. Because what we’re doing was right. There was just no if, ands or buts about it. We were just doing something that we felt right and that this family deserved to know what was either happening or just to know that we’re not just like the stereotypical natives who are dismissing anything that happens in the community. Because like I said, this young man was our age. And since then too, I’ve also been inspired during my time here of just picking up cycling as well. So even that, just that little bit of inspiration too, just made me become an avid cycler, be thankful for just being able to ride a bike because this young man can no longer do that now. 12:01 GK: I eventually want to complete that ride from Laguna to California, post my graduate career, just because I know, I think I need closure from that too, just being that I was pretty young at the time. I was impacted just from intensity and tension in the community because everybody kinda had an opinion on it a little bit, too, but it’s like it never left me. I guess that’s always been like a part of me, too is just like I keep that in the back of my head because who knows when our time is gonna be up or when we’re gonna be called back home. We have to make every action, every thing that we have part of our lives, do it to the full extent, give it your all. 12:46 ST: Geoff chose to give it his all by pursuing higher education. In fact, now he is actually in graduate school. But going to college meant going further from his parents and further from his pueblo. He remembers his dad taking him to visit the NAU campus way back when he was just starting high school. 13:08 GK: From there, he just started my interest of being comfortable of being away, saying that Flagstaff isn’t too far from Laguna. And we also have a name for the San Francisco Peaks as well. So you’re not too far away from home, our people have been here before, so take full advantage of their spirits, and are people who’re just always around us and watching us too. So I think that just gave me a sense of being comfortable. 13:37 ST: Season Two of Do Good, Be Good is sponsored by my AmeriCorps webinar series. As my former state program officer used to say, it all comes down to member management. If you are facing challenges with member management, contact me at connect at sharonspeaks.com for more information about hosting a live webinar for your AmeriCorps site supervisors. That’s connect at sharonspeaks.com. Mention this podcast for a 20% discount. Speaking of AmeriCorps, let’s hear about how Geoff got involved with AmeriCorps VISTA. 15:29 GK: From that moment on, I started making those communications with their home teacher, “I’m hosting this event. I would really like for you to come and present your information, your research and have the students show off their research.” And so, on top of that, I was like, “I also wanna make it like a film festival.” So I made it like a two-day event out of one evening lecture. It was a packed house for those student presentations. It was like a big group of students and so they brought all their dioramas, their journals. They packed the house and they had the crowd eating from their hands, essentially. The kids were like showing how to properly catch butterflies and the technique. And so the kids were like with their nets all kind of down low. It was like, “Yes, I can catch a butterfly,” and like, “Pew.” The crowd just was like loving the charisma, all their different stories, and then after that, too. And even then too they were like… This was like the first time they presented or kind of like were illustrating their research. And so, all of them were all in their best dress. Some of them had their fedora hats on. 16:31 ST: How old were they? 16:32 GK: I think they were like in third grade, fourth grade. So it was just kind of neat to give them that platform. The next day, I did pretty much like a film series, also at the planetary museum. So I essentially had, based on like STEM education, my main theme was stewardship. So stewardship again is like relating to the students. It’s like they’re monitoring monarch butterfly species through their research. They notice there was something not right. Their research is contributing to the continuation of the monarch species as well. The next day, it was primarily indigenous-based films that related to environmental justice, a couple local films and occupation at Standing Rock that was happening at that time, too. And then also a Pueblo food diet experience or a Pueblo food experience film so that stewardship kind of also related to that sense for like food awareness, food sovereignty. 17:22 GK: And I just had a lot of fun organizing that. I had a lot of fun just… I was able to coordinate all that, get food ready, see like the community come out and just like enjoy themselves, honestly. Education is like the first step, any sort of justice, honestly. So even just giving like that platform to the kids or just bringing awareness to different issues through the films and also resources through like the different organizations that tabled that day as well. A diversified representation of about Flagstaff history is like a tremendous step forward. And this goes along with all facets of communication, of just like proper representation. 18:00 GK: Reversing this whole role of like toxic tourism that’s prevalent here in the Southwest region, specifically looking at manifest destiny and all these different elements, too. But while there’s other communities and people that contributed to the success of the Southwest or just history in general, too. So just kind of giving the spotlight for these community members or families that have honestly impacted and are still part of Flagstaff to this day, honestly. So again, that’s a tremendous step forward and I think they really are at the forefront of kind of challenging that idea of history. But shout outs to Bill. He’s a tremendous leader for that team. He definitely knows when he’s needed and kinda jumps in, he’s so supportive. He’s anything that we think that might help contribute to the impact of any of the artifacts or kind of events that they do. He’s all for it. He’s really had me recognize that there’s other supporters out there that definitely take the initiative to listen. I think listening too, is just like another component of just taking a step forward of advancing a proper representation. So Bill’s doing a tremendous job with the historical society. 19:35 ST: White, people who fit, when you think of a pioneer museum with a big train engine out front. It was exciting to just see all ages, and all backgrounds, coming out for that special night that you had hosted and realizing that, yeah, sometimes it takes just changing up the topic, changing up who you invite to speak. And I love that you said you gave that platform to the kids and to people who wouldn’t normally be there, speaking at a Night at the Museum event. I think that’s a good lesson for a lot of people about, “How do you change representation?” Well some of that is you change who you give the mic to and who you invite to be a guest. 20:19 ST: Before Geoff left, I asked him what he thought it meant to be good. 20:24 GK: Being good is just like having love with everything you do, whether if it’s if you’re walking your dog having that love and being good, having a good relationship or being a good communicator. But just doing everything out of love, has been so prevalent in my life, because if you don’t do it with love, what’s the purpose of it? 20:52 ST: Thank you for listening to Do Good, Be Good. For show notes on all of our episodes, visit dogoodbegoodshow.com. If you want more behind the scenes stories and insights, check out the show page at Facebook.com/DoGoodBeGoodShow. Thank you to Geoff Kie for coming into the studio and sharing your story. On next week’s episode, we’ll be talking to another AmeriCorps VISTA member, who I met in that same program. But her first term of service with VISTA was actually in the early days of the program and some things were very different back then. To subscribe to the podcast so that you get each episode as soon as it is released, search for Do Good, Be Good in Apple Podcast, Stitcher, Google Music or whatever podcast app of choice you have. Any fine purveyor of podcast should have Do good, Be good. And if they don’t, please let us know. Email me at Connect at sharonspeaks.com. This podcast was produced with help, from Sun Sounds of Arizona. Music in this episode is “Bathed in Fine Dust” by Andy G. Cohen released under Creative Commons Attribution International License and discovered in the free music archive. Until next week, this is Sharon Tewksbury-Bloom, signing off.